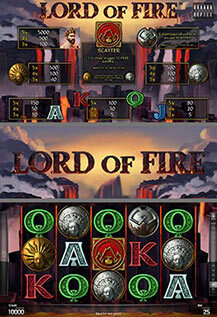 This fiery video slot comes with superior win chances on 25 lines and 5 reels! The Reel Refill™ Feature and many extras during the free games guarantee a special gaming experience. WILD substitutes all symbols except SCATTERS during the base game. 3 VOLCANO SCATTERS trigger 10 free games. During the free games SUN and MOON symbols pay scattered on any position. Free games can be won again during the feature (5 for 3 VOLCANOS, 10 for 4 VOLCANOS and 15 for 5 VOLCANOS) and are played at current bet.